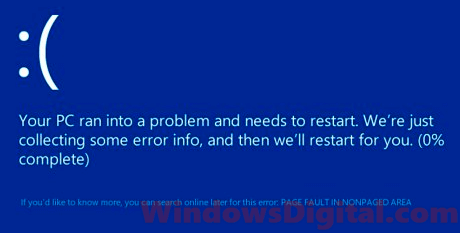 The error Page fault in nonpaged area or page_fault_in_nonpaged_area is a blue screen error in Windows 10 which usually appears as a stop code in the blue screen message that reads “Your PC ran into a problem and needs to restart. We’re just collecting some error info, and then we’ll restart for you”. The cause of the problem can be just about anything that relates to system files or hard drive error. For instance, corrupted or missing system files right after a major Windows 10 Update install, driver conflicts, hard disk error, conflicts between software such as antivirus program or even a faulty ram could result in the blue screen error Page fault in nonpaged area in Windows 10. To get out of the blue screen error, follow the solutions below. We have sorted the solutions by their importance. You can work your way down the list until you find one that works to fix the Page fault in nonpages area blue screen error. 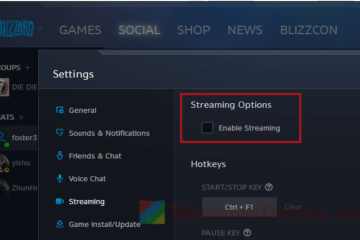 If your computer is still usable and you can still get into your Windows 10, go to start menu and type cmd. Right-click command prompt from the search result and select Run as administrator. In the command prompt, type the following commands. This command will allow Windows to automatically scan and repair missing or corrupted system files. The process may take some time. When it’s completed, enter the next command. It may ask if you would like to schedule a full scan on your next restart due to disk volume being used by another process. Type Y to have it done so. 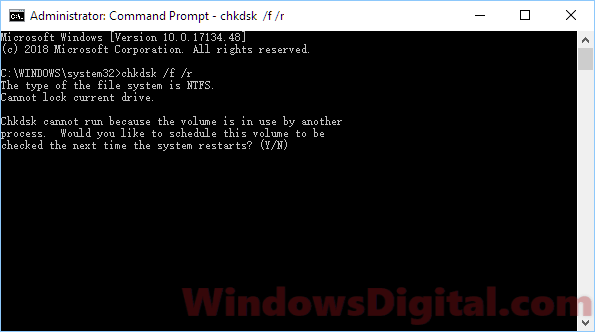 Restart your computer and the CHKDSK will be started automatically. 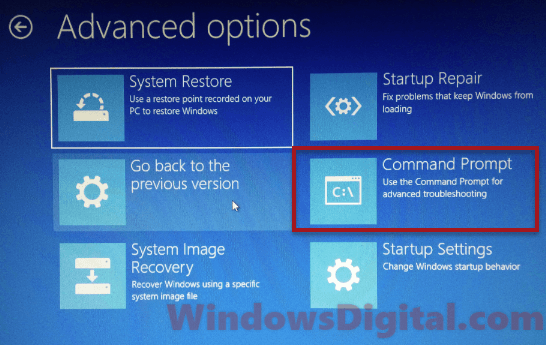 If you cannot boot into your Windows 10 to open the command prompt, try to boot into Windows 10 safe mode. 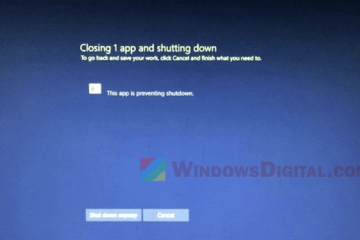 If you are getting the blue screen error page fault in nonpaged area even in Windows 10 safe mode, you need to boot into Windows recovery mode. To force boot into recovery mode, you can do this: Hold and press the power switch of your computer for about 5 seconds until the computer is completed off. Switch it on again. When it starts to load Windows, force shutdown using the same method again. Do this for 3 times continuously. When Windows detects too many failed startups, it will boot into Windows recovery automatically. In Windows recovery, go to Troubleshoot. Select Advanced options, then open Command Prompt. Execute the two commands mentioned above. When both scans are completed, try to reproduce the Page fault in nonpaged area Windows 10 blue screen error and see if it will still appear. The Page fault in nonpaged area Windows 10 blue screen error could also be due to wrongly set or insufficient paging file size. 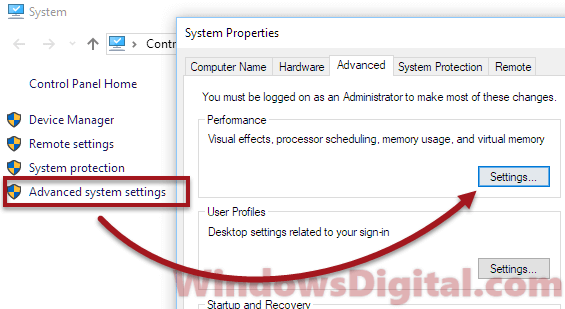 To check your paging file and virtual memory, follow the steps below. Type System and open it. From the left pane, click on Advanced system settings. In performance options window, go to Advanced tab. Click Change under virtual memory. 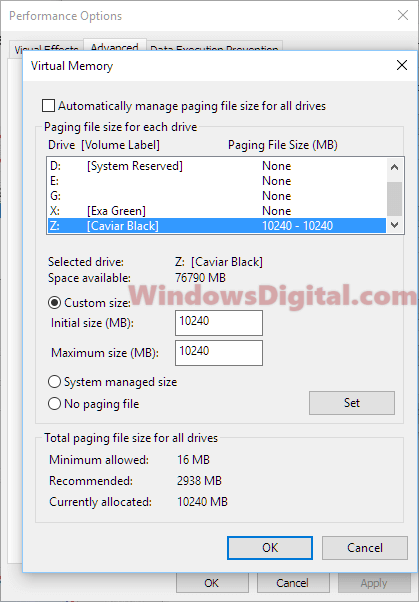 If the automatically manage paging file size for all drives option is enabled, uncheck to disable it. Then, select a drive which you can spare some disk space for virtual memory. Choose Custom Size and give it 5000 MB or any size you want (preferably a size higher than the recommended paging file size). If the automatically manage paging file size option was disabled by default, increase the paging file size (just double the current custom file size). Restart your computer and see if the page fault in nonpaged area blue screen error is resolved. Since it’s system file related, it’s useful to run Windows Updates to check if there is any latest bug fix release. Go to Settings, Update & Security, then click Check for updates. It’s also recommended to check your drivers and make sure they are up to date. 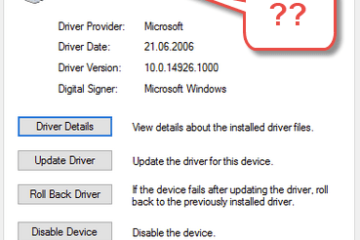 To check drivers, go to start menu. Search for Device Manager and open it. Select a hardware, right-click it and click on Update driver to allow Windows to automatically scan for latest driver from Windows repository. You should check driver for particularly your graphic card, sound card and other audio drivers. A broken or outdated driver could be the cause of the page fault in nonpaged area blue screen error in Windows 10. If you suspect a recent Windows Update (particularly April 2018 update 1803) causes the error, you may want to try to roll back Windows 10 update. If the rollback doesn’t appear as an option, you may want to system restore Windows 10 to a previous date. 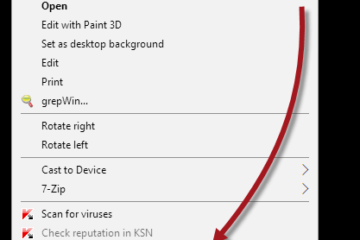 Description for sharing: If you keep getting the Page fault in nonpaged area or page_fault_in_nonpaged_area blue screen error in Windows 10 even in safe mode, here's what's the stop code is about and how to fix it.